Kean Miller is dedicated to hiring people with the strongest academic records and highest levels of personal achievement. Our primary recruiting effort consists of on-campus interviews in the fall and spring and in-office interviews with students from other law schools around the country. Kean Miller’s Recruiting Committee, co-chaired by Scott Huffstetler and Tod Everage, is composed of partners and associates from various practice groups. The Committee administers all aspects of the recruiting efforts of the firm, whether for law clerks, lateral hires, or persons hired directly from law school. The summer clerk program is designed to expose clerks to all aspects of the firm's practice. We make an effort to ensure the clerks have an opportunity to attend hearings, depositions, trials, and client meetings where appropriate. Each clerk is paired with an associate attorney who acts as a mentor to the clerk for the course of the clerkship. The attorney provides guidance, support and advice, coordinates lunches, and helps the clerk get acquainted with other attorneys in the firm. Kean Miller is an equal opportunity employer. We hire associates for either partnership track or staff attorney positions. Associates are hired for particular practice and client needs. Kean Miller has high academic and personal achievement standards for its new hires and Law Review candidates are looked upon favorably. We also consider graduates completing federal and state judicial clerkships. In the last few years, the firm has hired 3-6 attorneys per year. Kean Miller continues to hire the most experienced people who exceed in their areas of expertise. 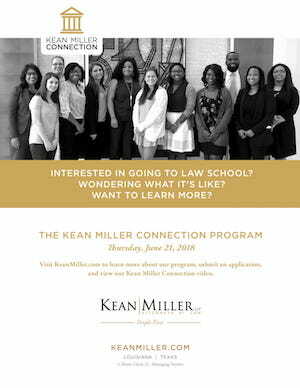 The Kean Miller Connection is a 2-day law school preparatory program for college students. Attorneys from Kean Miller and other special guests, provide an intense overview of the law school experience. The goal is to "connect" each student with information helpful to their decisions to attend law school and become an attorney. Click here for more details. We continue to seek a more diverse environment by recruiting at all four law schools in Louisiana and regularly participating in state and regional minority law student job fairs. Among our 2018 summer law clerks, 33% were women and 33% were minorities. Of our class of new associates who started in September 2018, 100% were women.